Memory Box is hot, hot, HOT! Happy 2014! Let's Make it OUR Year! Oh my goodness! You guys are loving the Memory Box product! A shipment snuck into the store yesterday and those of you who were in, snagged their beautiful new stencils! I had no clue these were going to be so popular. The bad news is that there is only one left (the image above) but the good news is that I have placed another HUGE order and they should be here is a couple of weeks! 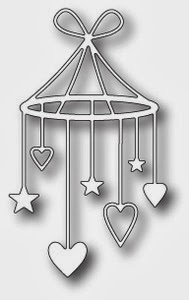 In the meantime, check out Memory Box's website and see if there are any stencils you cannot live without! I would be happy to order them in for you. Just email me! I was smart when I ordered the dies and there is an amazing selection to choose from!! Have a look at some of these beauties that came in!! I am in love! Debbie has been busy creating some amazing cards using the Memory Box dies. 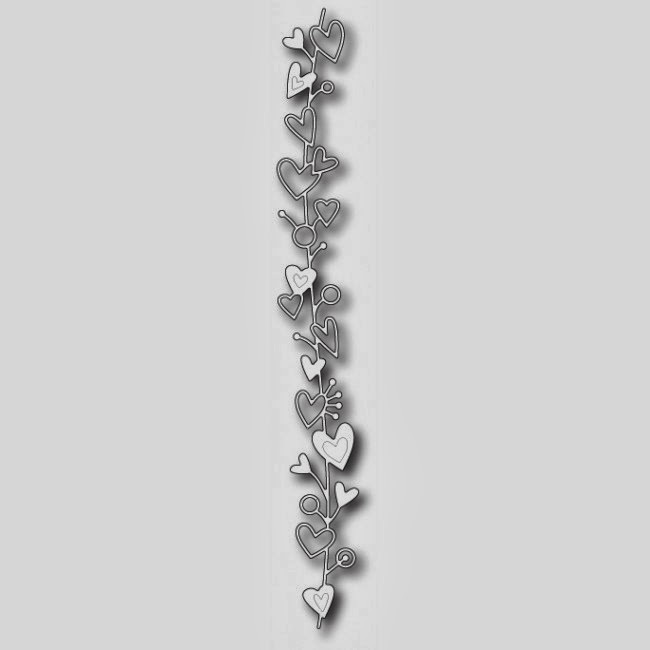 Check these out here or pop into the store to see how beautiful they are in person! Oh wow! Thank you to everyone for all the great product suggestions and kind words while I was in California! The amount of new product released at CHA was unreal and even overwhelming (but definitely overwhelming in a good way!) so I definitely appreciated the words of advice. 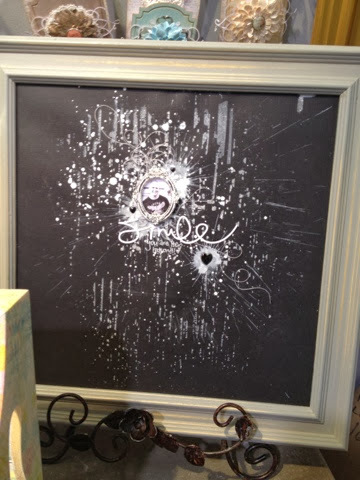 Many products can be used with stencils including sprays, chalk and ink! I noticed that you are all loving the stencils from the various companies! Stencils and various sprays were definitely hot at the show! 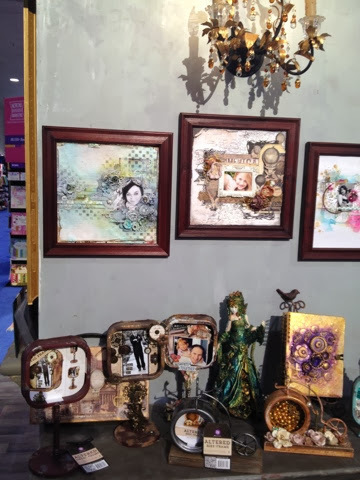 We currently have stencils in from Tim Holtz and Crafter's Workshop in the store right now but more will be on their way! 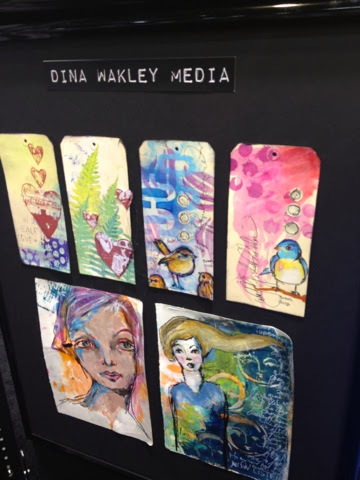 I really liked the stencils from Heidi Swapp. 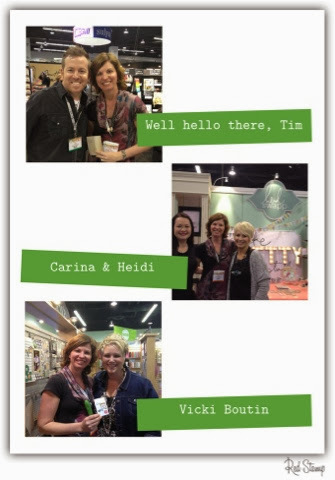 And like Jackie P. and Nicole, I too fell in love with Tim's new stencils including the crocodile pattern as well as the chevron wood grain and latticework designs! These have all been ordered and we will see them once released from the company! 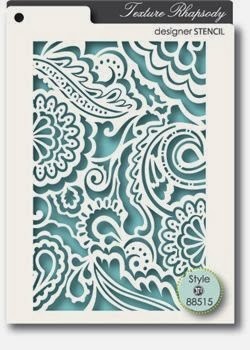 Stencils and sprays are great to use on art journals, mixed media canvas projects, scrapbook layouts and cards! 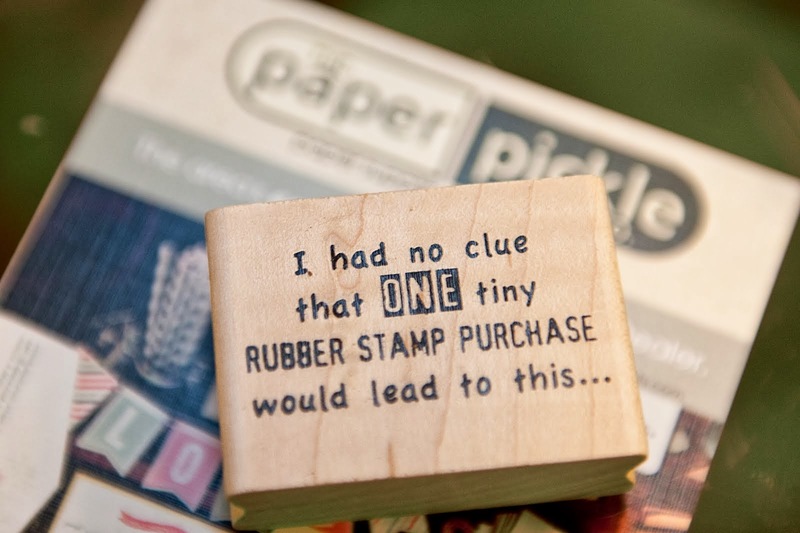 I am thrilled that you like the same stamps that I do! 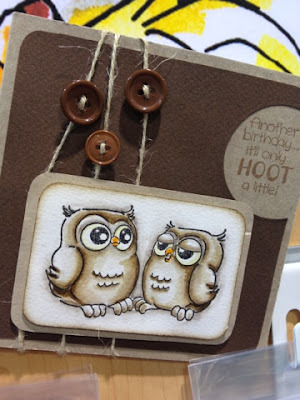 Debbie said that she could see using the humorous stamps from Art Impressions on cards for her friends and CraftyViolet said she liked the cute little owl stamps too! Owls were very hot at this show! 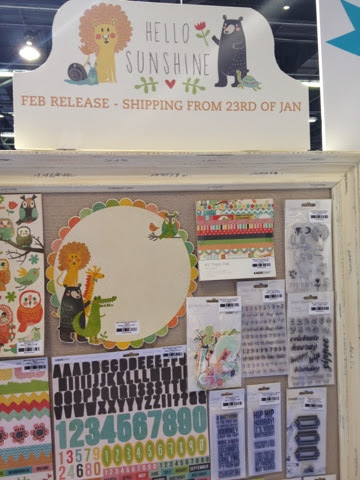 I am not sure if I mentioned this already, but it was when I saw the stamp company's booths, it was like I was in heaven. 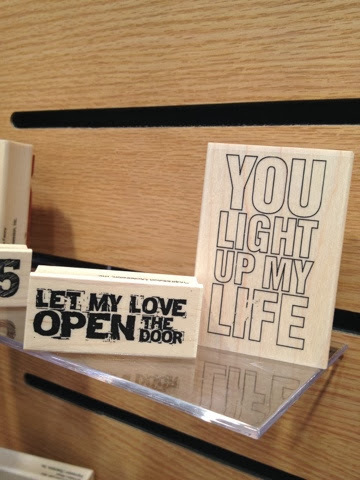 The samples were inspiring and even seeing the wood mount stamps themselves made me smile! A HUGE order for Penny Black stamps has been made! I have also ordered from Some Odd Girl Stamps. 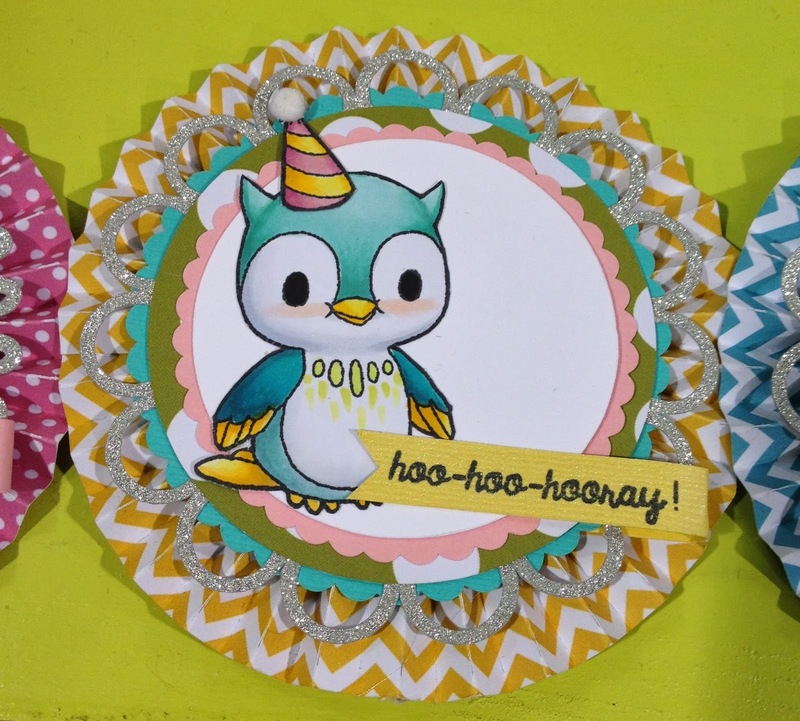 If you are not familiar with this company, have a look at this adorable little penguin card. If you like colouring, these stamps are for you. 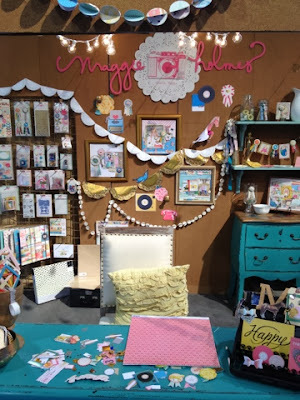 You will be seeing dies from this adorable company at The Pickle! It was incredible to see the number of companies now offering dies! This is definitely one product that is not going away anytime soon. 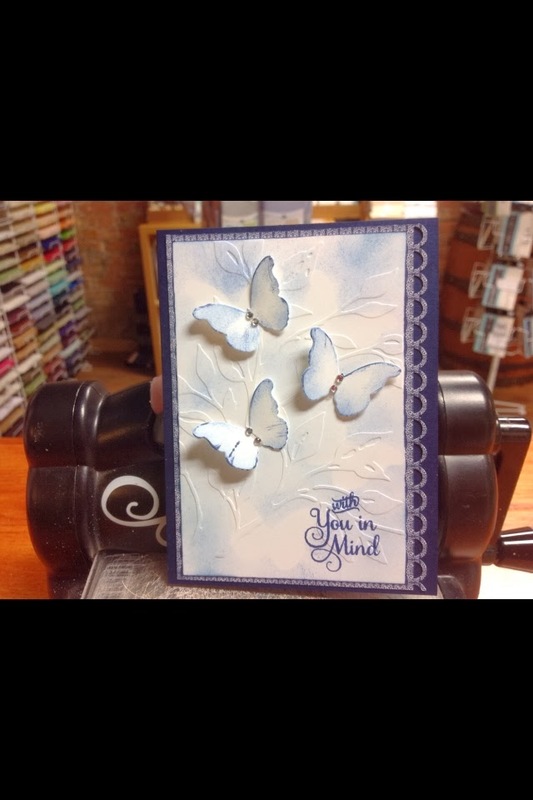 Use dies on your page layouts, mixed media (as masks ,etc) and of course cards! Penny Black has some detailed dies that I know you will love. They too are on their way! 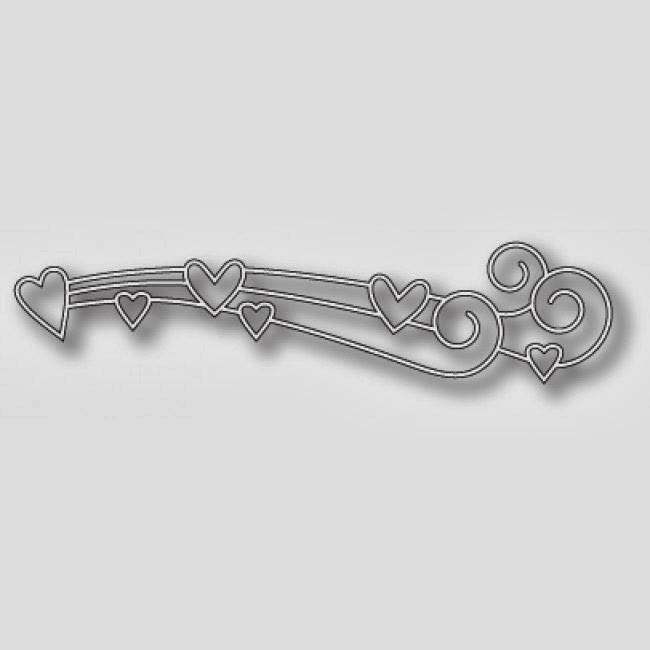 Did you know we just received a shipment of the new Memory Box dies last week? An additional order is on it's way! They are THIS hot! Pauline, you will be happy to know many more of the new releases will be here next week! So I made note of each and every comment. Thank you again! 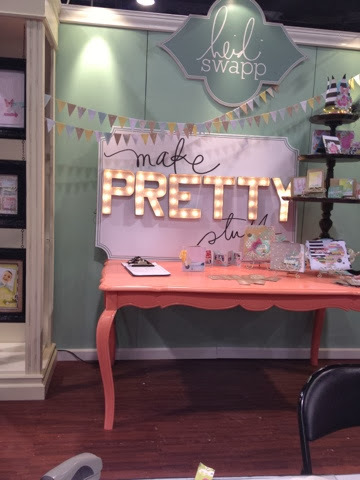 Each comment was assigned a number and after using a random number app on my phone, the winner was comment number 29 from Debbie B stating that she would love to see more of the Heidi Swapp Colour Shine in the store!! 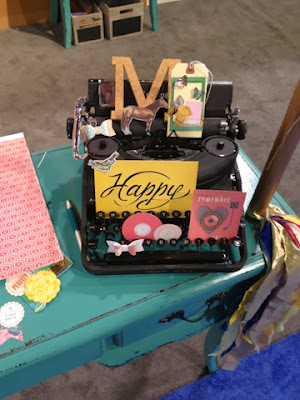 I played with that product at the Heidi Swapp make and take table and I really loved the product. The shimmer was incredible. Thank you for the suggestion! Debbie has won a $100 gift basket which is ready to be picked up anytime during store hours! Congratulations! There were also two runner up winners! 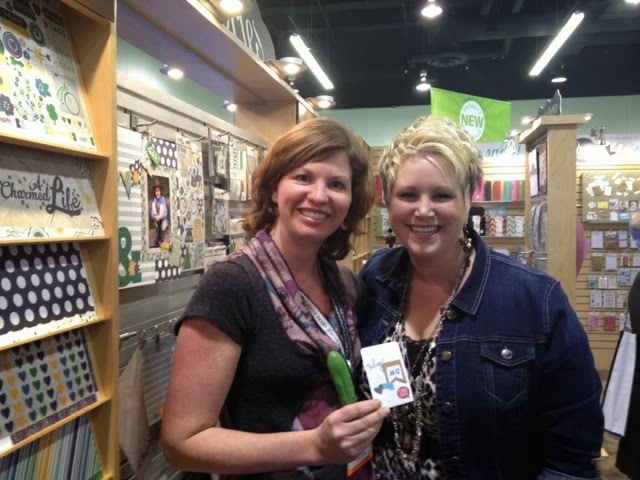 Nicole L. and Jackie P., you can pick up your 6x6 paper pads anytime during store hours! Thank you to everyone for playing along! The Paper Pickle will be at the Chatham Kent Wedding Show this Saturday at the Bradley Convention Centre in Chatham. Stop in and see our unique and beautiful invitation and stationery designs anytime between 11am-6pm!! I am very passionate about paper and I LOVE creating custom invitations for my couples!! Sunny California - I will miss you! This photo was featured in an ad campaign Envelopments ran in Martha Stewart Weddings. I, too, use this image at wedding shows to promote this incredible line! Before I left for California, I did a little research and realized that the Envelopment's head office was only 15 minutes from our hotel. 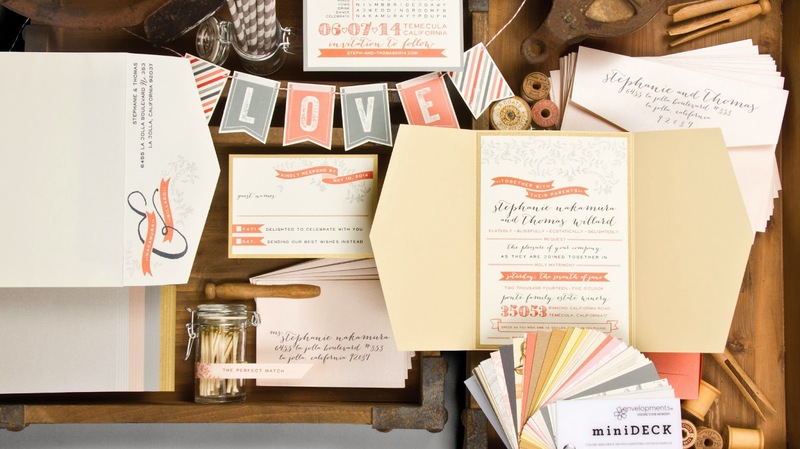 Envelopments is an amazing company with this most gorgeous paper and paper products perfect for invitations including pockets and other enclosures. They are very popular with many of my brides. 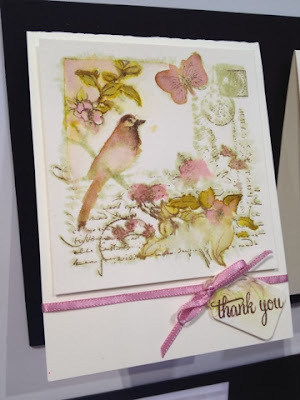 Cardmakers also go crazy for their designer shimmer cardstocks. Their quality and product offering is second to none. 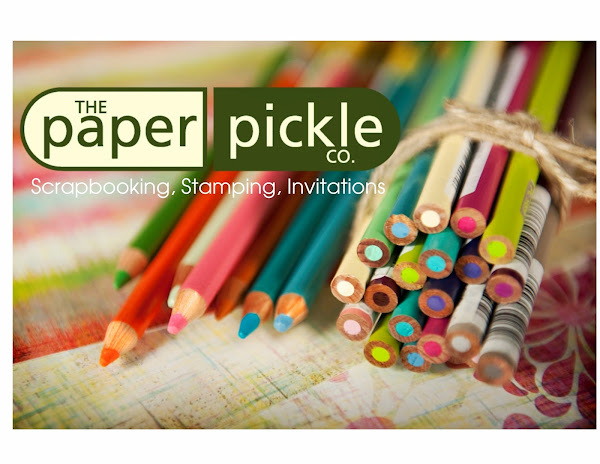 And I am proud to say that The Paper Pickle Company is the area's exclusive Envelopments dealer! I contacted the company and was thrilled that they agreed to allow me to visit! 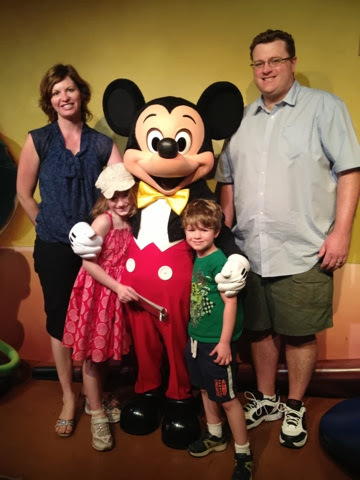 I could not wait to see where the magic happened! 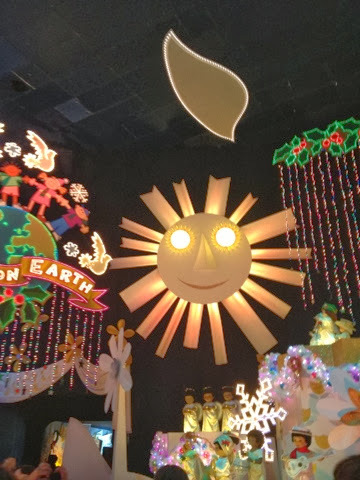 I HAD to take a picture of this prop used in the ad above! The moment I arrived, I knew I was in for a treat! 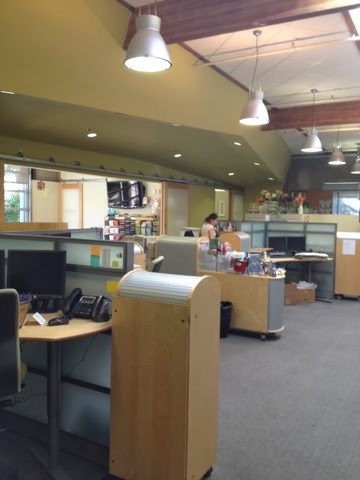 Jennifer, the Business Development and Marketing Communications manager showed me around and personally introduced me to every member of their team. Everyone was so warm and welcoming. I loved the open concept. The paint, furniture and numerous windows added to the fresh and creative atmosphere! They even have their own Zen garden! I felt so tall next to Jennifer and Laura! I have to smile when I look at this photo. They look like they are dressed for winter (or working in a cool office) and I am the tourist in flip flops! What am I wearing? Really? It's like business on top and party on the bottom! Ha! I mean it was 85F that day!! Ha. Such cute girls! I had a chance to see the new designer papers and colours and I cannot wait to offer these to you! I am absolutely in love with the colours and patterns. 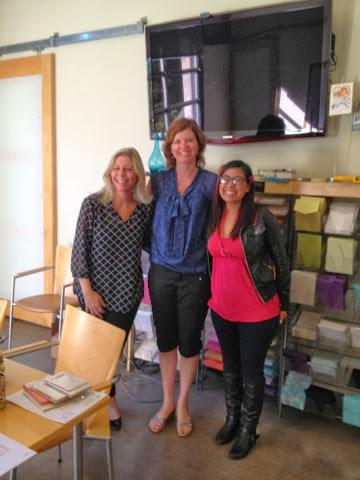 I know designs will come easily to me with the help from this leading edge company! 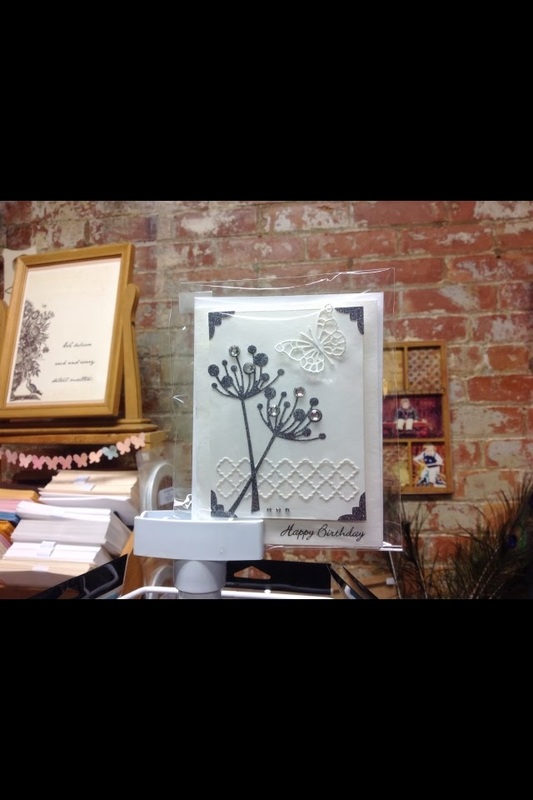 I also got to see the die cutting machine in action and that just blew me away! We could make some serious progress and designs with our Memory Box dies in that machine!! Another thing that blew me away? 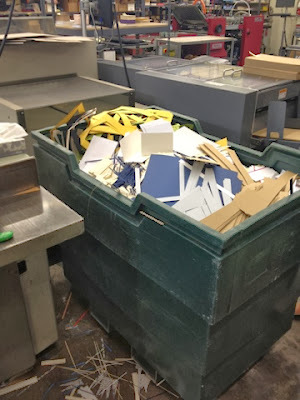 The amount of scrap paper that could be generated by a company like this. Have a look at this bin! 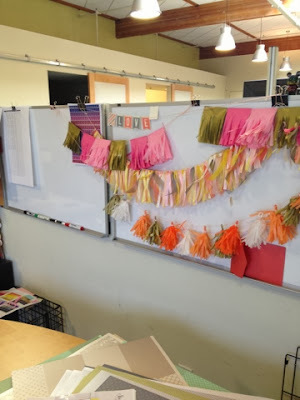 Scraps are always an issue for any paper crafter. The question is always, "keep or toss". I had to ask Jennifer about this and I was thrilled to hear that these scraps get donated to various agencies who put them to good use. Programs use these scaps for children's crafts, etc. How amazing. If I ever decide to move to California, I know where I will start looking for a job! Ha! Day 7 - ...Play Hard! It seemed strange but it was still Christmas at Disney! Julia was thrilled to get two more autographs in her Simple Stories Say Cheese autograph book! Anyone going to Disney NEEDS this great little book complete with autograph area and placed for pictures. I will ask the boss if I can bring hers to the store to show you! 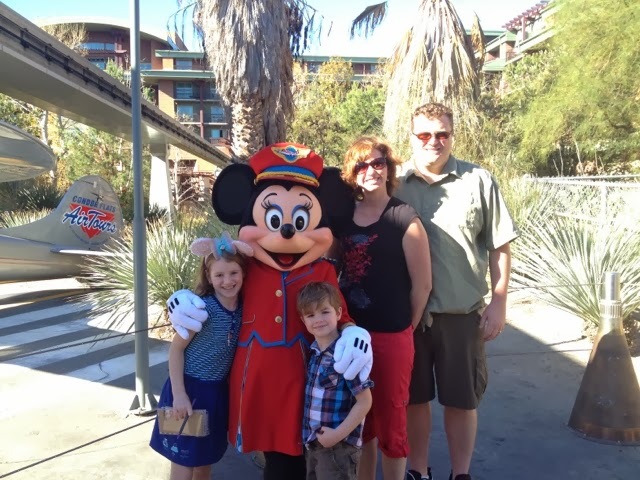 We met THE Mouse of all Mice! He was ready for this photo op in his house! 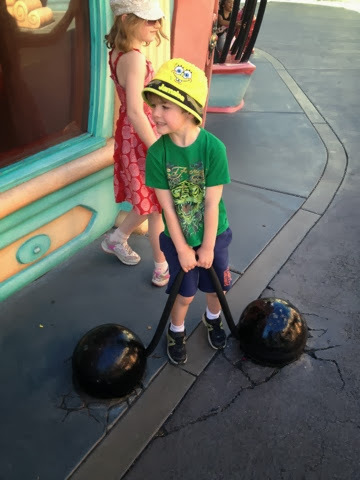 He was really working hard to lift these out of the ground. Anyone who knows me knows this is my favourite movie. Day 8 was a very long day of travel. Trevor was concerned with morning rush hour traffic in LA. I didn't really think about that when I booked our 11:38am flight. We left the hotel just after 7am to beat the traffic. We did make the mistake of hitting the road immediately after eating breakfast but this time we were prepared and Coulter knew just what to do with his Target bags! We made it with plenty of time to spare. That was fine as we sat and relaxed and got ready for the flight home. Once boarded, the flight was delayed an hour due to issues with the luggage weight but that was fine. I spent the entire hour (and more) sorting through my new catalogues and choosing which products are a must for the store! I was in my happy place. 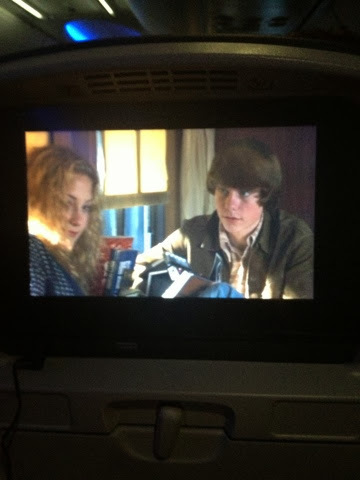 The icing on this trip's cake came when I started scanning through the flight's movie choices and came across the movie "Almost Famous". Like, really?? This movie is older and more of an indie hit so of course I was surprised. The first scene shows a California beach town in 1973 during the Christmas season with Alvin and the Chipmunks singing. It was all too perfect. I don't know why this little detail just made my trip but it did! We landed after 8pm local time, drove through our "welcome home" Canadian snowstorm and were safe and sound in our house by midnight. Ahhh....It felt good to be home. After all these post, I'm sure you can conclude that the trip was a success! I will admit that it was one of the most rewarding trips I have ever been on. It was incredible to experience the California beaches and Disney together as a family. We learned so much and laughed so much. There were so many firsts and I will never forget it! 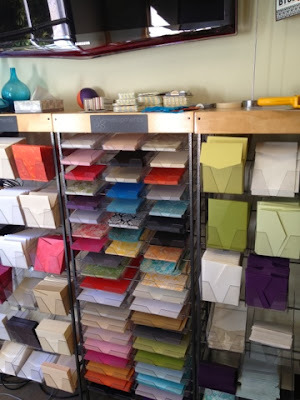 PS...The store is open Saturday (9:30am-3pm) and it is the last day of our sale (BOGO 50% off all stamps, dies and embossing folders). It is also the last day of our contest! Add comments to the blog or facebook and you will be entered into a draw for very yummy goodies which will take place next week! Winner to be announced Thursday morning! The amazing weather and beautiful beaches. 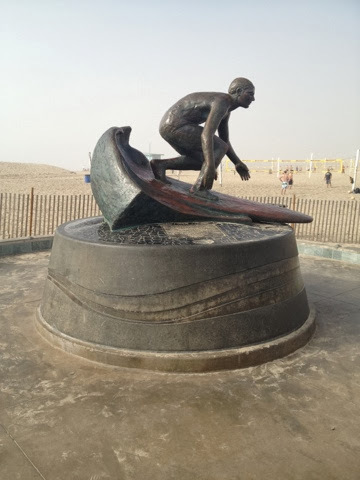 Today we visited Surf City USA - Huntington Beach. 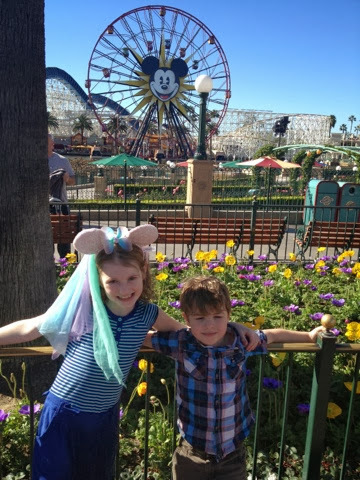 Unreal family fun at Disneyland! We have all been over the moon since we got here! 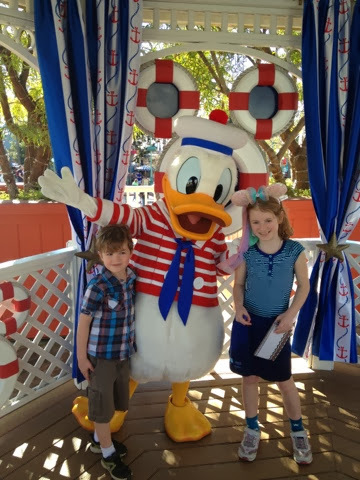 Good old fashion family fun and memories to treasure. The incredible amount of beautiful products at every turn! Look at this booth! Gorgeous! Crate Paper - So fun! Amazing Samples to showcase beautiful product! This photo does not do this art work justice. Unreal. Love these stamps. (Basic Grey always has wonderful displays showcasing their product. This line is another one you will be seeing in The Pickle!). Honestly guys, this working vacation has me recharged and ready to tackle the world. I have so many ideas in my head and all I want to do is paper craft!! This has been amazing and I cannot wait to share my ideas, creations and experiences with you! What a day! CHA was incredible. I was there from the moment the doors opened until the very end! 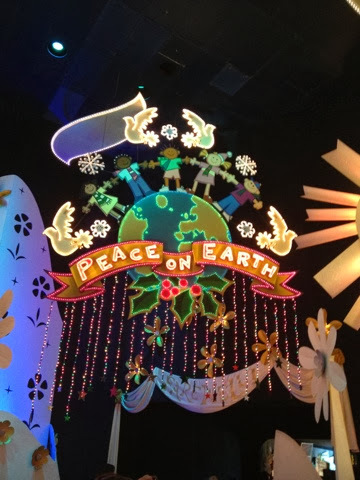 Eight magnificent hours of gazing, touching and smiling - and that was all at Tim! Just kidding. Ha! I cannot possibly share my entire experience in this one post so today's post will focus on the people of CHA. 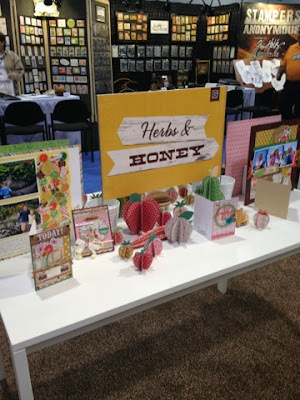 Attending CHA is such an unreal experience because all the celebrities of the crafting world walk around the show like regular people. Chatting with each other and even ME...sharing compliments, shop talk and everyday occurrences. Hi Vicki! Didn't mean to cut you out in my earlier post! 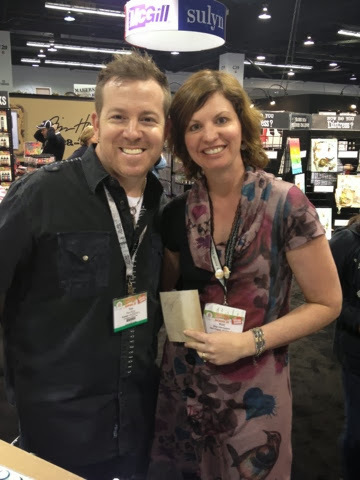 Vicki Boutin was the first celeb I chatted with at the Simple Stories make and take booth. As you know, Vicki is huge in the scrapbooking world and her samples were seen throughout the show (at Simple Stories, Basic Grey and more). She scraps her family and does an amazing job with the hybrid albums like SNAP and Capture. And she IS Canadian! It was nice to chat with her about teaching and designing. 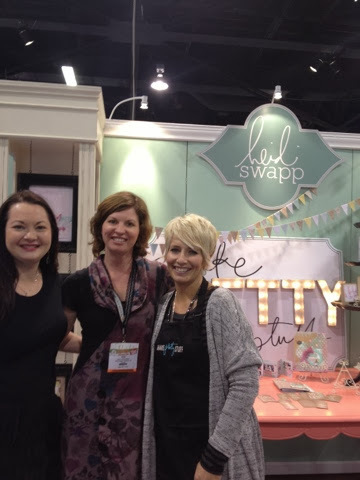 The next booth I stumbled upon was Heidi Swapp's. 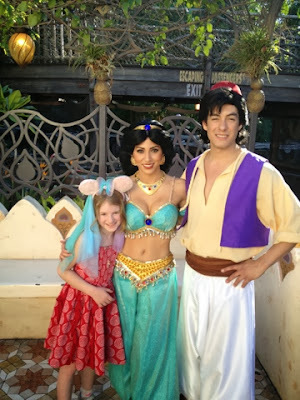 The picture at the top of the blog is her "pretty" booth. I absolutely love her style. She always seems to be steps ahead of the competition in terms if product innovation and I admire that. We chatted about her eldest son doing all of her Christmas shopping this year bc she was just too busy. He recently got his driver's license so she gave him $500 and told him go and make her look like a "good mom". I could only imagine how demanding her job is and to top it off, she has 5 children ranging from 16 to 6. 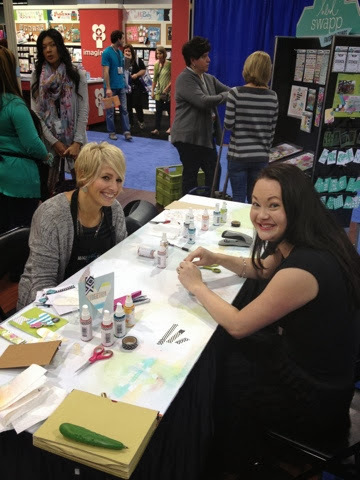 While at the Heidi Swap booth, Carina, the creative designer of Carta Bella came over and we made a make and take together. Carina chatted with me (!) and Heidi about her "Glamping" Tour. What a great girl. I had a little lunch and wandered quite awhile more and then it happened. Just when I thought I had missed Tim demoing...there he was, like a mirage. 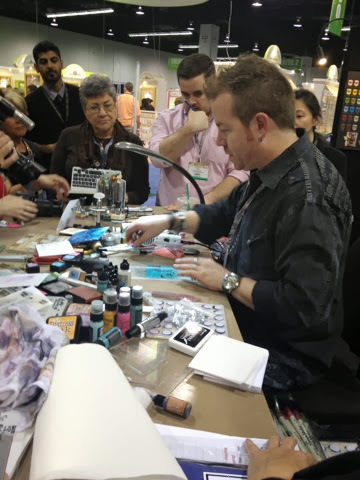 He was demoing alcohol inks and showing off his new alcohol ink palette and blender pen (a must for The Pickle!). Hello Tim! Even got an autograph. He also demoed his new shears. It was hilarious when one woman said she uses his scissors to cut everything from paper to peanut brittle! That lead into a story from Tim. He mentioned a fan had messaged him and told him his scissors cut chicken very well (who knew?). He said he does not cook at all so he pictured the family with a spoon, fork and Tim scissors all at the table setting! So funny! More fun stuff to come but I better run before the kids get restless here!! 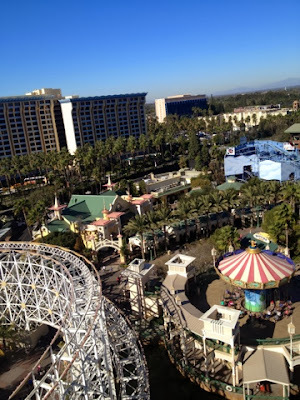 We are tackling Disney's California Adventure Park today. Hope all is well! I'm sorry guys but I think I may never return. California has stolen my heart today. 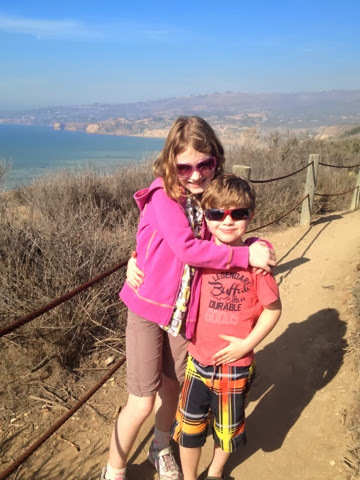 Today we decided to hit the road and headed to the coast. The end destination was to be Santa Monica and the beautiful and infamous Pier. I have learned a few things since being a parent. A Golden Rule of mine has always been roll with the punches. And that we did today. We had a nice (and FREE) breakfast here at the Homewood (I would recommend this hotel for any family!) 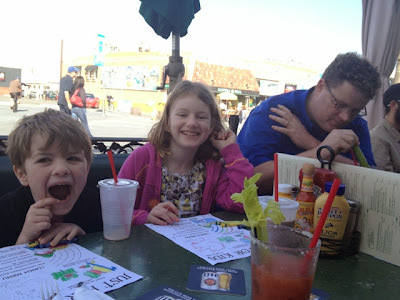 and immediately hit the road for our final destination - Santa Monica. Note the word "immediately". 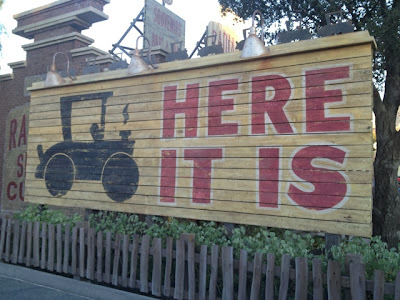 This may have been a mistake (a little foreshadowing for you). A little bump occurred when we heard Coulter crying in the backseat. His tummy hurt. Luckily, I had just enough time to hand him (and sacrifice) my coveted Jamaica messenger bag. All this happened while traveling on one of the busiest highways in the entire United States. Talk about multitasking at its best! The navigator and comforter/mom hats were on and in full effect! Luckily we managed to find a grocery store and got the boy cleaned up. The next stop was nothing but exceptional. 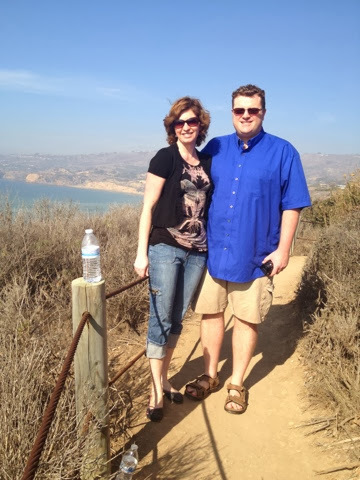 We drove one of the most beautiful stretches of road I have ever seen - The Palos Verdes. We pulled off to get a picture and check out the view. Next thing you knew, we were at the Trump National Golf Club (a public course which is rated one of the top 100 courses in the world). 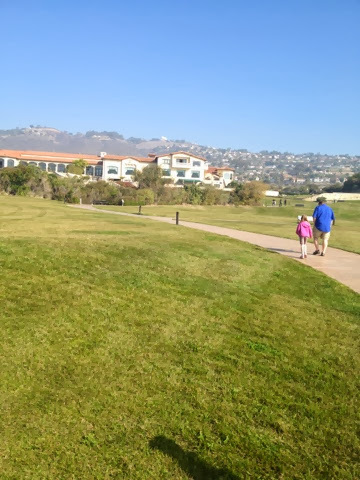 We are not golfers but we did walk the trails around the course and got some beautiful photos and wonderful memories. I made sure to stop and breathe it in! So we got back on the road and were ready for Santa Monica! But no....once again we heard the dreaded "my tummy hurts". Luckily, we were ready! Let's just say it was my attention to detail that saved the day! There was a hole in the plastic grocery store bag and thankfully I tied it in a knot. This was when The Golden Rule came into effect. 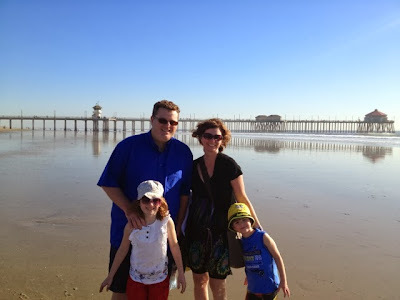 Either continue on the Santa Monica and run the risk of more comments from the peanut gallery (ha!) or make a change of plans. And that's just what we did. Next stop....ANY beach! Any place with open air and washrooms (or bushes!). We ended up at Hermosa Beach. And it was perfect. 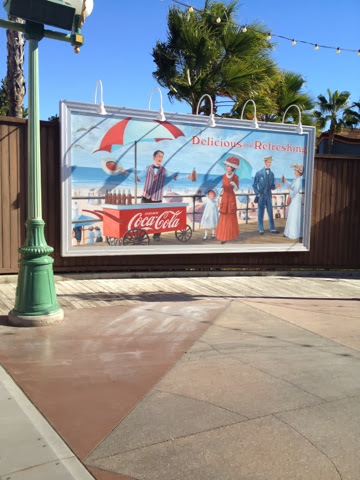 What a charming beach town. We had a bite to eat. 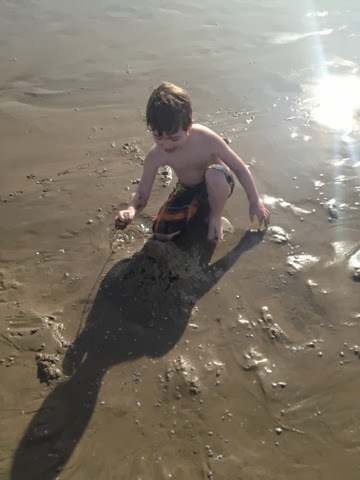 We checked out the beach. We survived AND thrived! 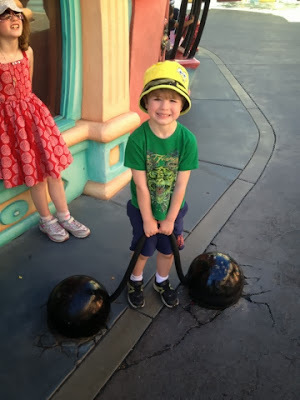 You would never know this little guy was car sick just hours earlier! So tomorrow is THE day!!! CHA day! I promise to work hard and work the floor checking out the coolest new products out there! Have you been following the various companies on Facebook or their blogs? i have! Honestly, have you seen Ranger's booth? The pictures are incredible! Actually, all the companies have impressed me. I cannot WAIT to see them in person! !